Leslie and Rick have been enjoying their own (no sugar) yogurt for awhile, and they were kind enough to share their recipe as today’s blog contributors. We’ve been making our own yogurt. All you need is milk (fat free, 1-2% or whole- your preference) and a high quality plain yogurt containing acidophilus & bifidus cultures (Stonyfield or Liberte work well). Basically, you need to heat the milk to 185 degrees fahrenheit, cool it down to 110 degrees and add starter yogurt (a soup spoon works well). Our technique makes the process very simple. We use a one quart ball mason jar filled with about three cups of milk. Place the jar in a medium sauce pan filled with water. Heat on high. It should only take about 5 minutes after the water boils for the milk temp to reach 185. Maintain the 185 for at least one minute. Using a candy thermometer as a spoon eliminates the need for an extra utensil since it’s in the jar anyway. Remove the jar from the pan. Pour out the hot water and replace with cold water. Set the jar back in the pan until the temp drops to 110. Stir the 2 blobs of yogurt in well, put a lid on the jar, wrap it in a kitchen towel and let it sit in a warm place (like near a radiator), for 10 hours. If there’s a little water on top of your yogurt, pour it off before refrigerating. This yogurt is a bit thinner in consistency than you may be used to, but that’s because there are no artificial thickeners. Make sure you leave enough of your home made yogurt in the jar to act as the starter for your next batch. Enjoy. This recipe is shared with Simply Sugar and Gluten Free, Miz Helen’s Country Cottage, Food Trip Friday, Cybele Pascal Allergen-Free Cuisine and Sweet as Sugar Cookies. This entry was posted in Recipes - Breakfast, Recipes - Snacks and tagged Cane sugar free, Yeast free, yogurt. Bookmark the permalink. 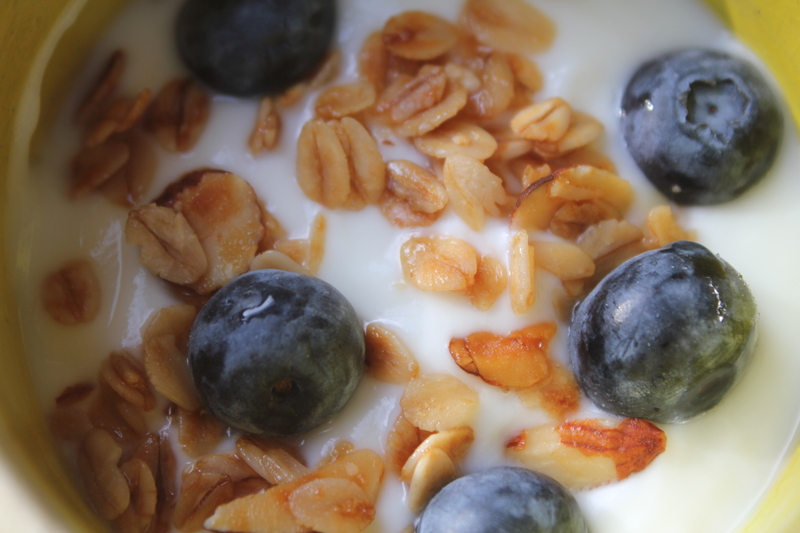 This is a great and economical way to make yogurt without thickeners and preservatives. Thanks for sharing your recipe! This yogurt has a fruit loopy taste! Very nice. That is for sure so delicious and healthy choice.. I love those blueberry toppings!!! I just love homemade Yogurt and your tips are great! Hope you have a wonderful week and a special Valentine Day. Thanks for sharing with Full Plate Thursday and come back soon! this recipe is very healthy 🙂 Visiting from FTF, hope that you can return the visit too.